So Christmas is almost upon us; the shops are lit in bright lights and sparkling tinsel, everywhere the food is becoming more and more fatty and delicious. We start ignoring our last new year’s resolutions and do buy that sumptuous chocolate cake that glistened a dark and luxurious brown from the window of our favorite bakery. And that is ok! Christmas is the time to think about the pleasure and joy in others and to let ourselves feel that same pleasure and joy. The shops are filled with rows and rows of toys which we all look forward to place into the hands of beaming kids. We are even humble enough to tell our children that this toy is not from us but from the magical Father Christmas, who is flying around and making children everywhere giggle. Imagine that feeling! Your job is solely to make children happy. Can there be anything more purely good than that? Luckily a vacancy has just opened up and we want you to fill it! Imagine being Father Christmas for a day, being someone magical and exotic who will delight and enchant the children. Well, we would like to give you this opportunity. Alpaca Expeditions has been working together with the small and secluded Andean village of Wakatinku, located deep in the Andean mountains. A village that supplies many of the porters whose tireless efforts ensure that your trek is the best it can be and a truly unforgettable experience. Many of the porters still have families who live in this village and who often lack even the most basic amenities that we take for granted. Because Alpaca Expeditions was founded on an altruistic principle we have been trying to give back to this village, and to say thank you to the backbone of this company – the porters, by supplying their families with some basic necessities. Over the past we have given hygiene products, school supplies, sports equipment and many other small but necessary things. We have even paid for an extra teacher to be sent to the village since the local school was sorely understaffed. This Christmas we want to bring the children of Wakatinku something special for Christmas and we would love your help. Over a year ago we started working with Wakatinku village and always focused on helping their school and schoolchildren. We have installed computers and internet in the school and sponsored a teacher to make sure their English and math education continued – and it has been such a pleasure to watch these kids grow and learn during this time. We feel honored to have been a small part of it. When the Director of the school explained to us that this would be the first graduating class ever from the school, we knew we needed to do something a little extra special for them. 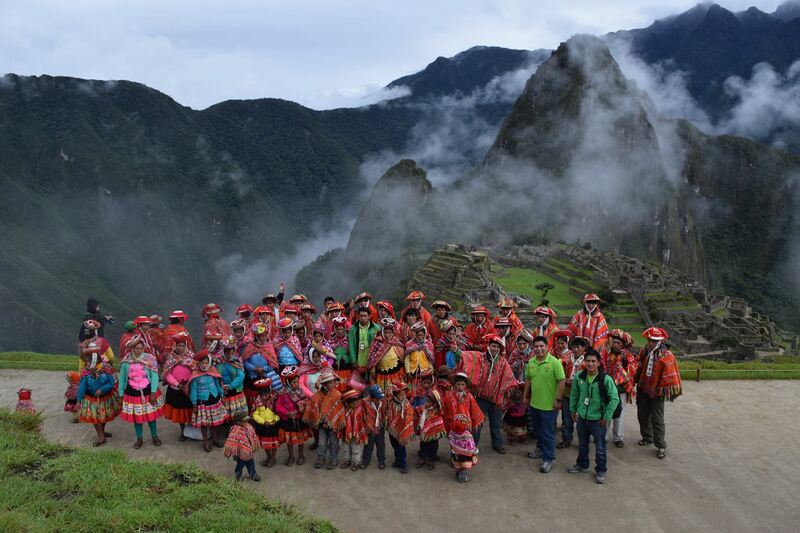 We invited the 17 graduating students, their families and some teachers – 52 people all together, to enjoy our 2D/1N Sacred Valley and Machu Picchu tour. It was their first time visiting Machu Picchu and it was so clear that they were in love with the citadel as soon as they entered. We of course all learn about our history growing up in the small villages outside of Cusco, but seeing our history alive is truly special! Nov 7th: Pick up was at 6.00 am from their village. We travelled the 4 hours back to Cusco to visit one of the most important ruins, Sacsayhuaman. Amazing Alpaca Tour Guides, Amoroso, Herlin, and Franzs explained everything to them, in their native language Quechua. After spending quite a bit of time there, we continued on to Pisaq Inka site. Everyone enjoyed a lovely picnic lunch in Urubamba and afterward we headed to our final stop, Ollantaytambo. Dinner was after the tour and then the 9PM train to Aguas Calientes for the night. Throughout the day, many of the students approached Raul Ccolque, owner of Alpaca Expeditions, about how much they appreciated this opportunity. These kids never imagined getting to these places and it is a moment we will never forget. Nov 8th : Early breakfast at the same restaurant where all our past clients have had lunch and dinner: El Tupana Wasi. At 7 am we boarded 2 buses for the 25 minute ride up to Machu Picchu. Words cannot describe the faces of the 52 villagers seeing Machu Picchu for the first time. What is amazing is that a lot of the families are our porters – and even though they have done the trek 100s of times, they have never had the chance to actually go inside – until now. It reminded us of how important these social projects are and renewed our dedication to keeping them up and expanding them. We separated into three groups, with our guides continuing their presentation and took countless photos. It made everyone involved so proud to be Cusqueñan and the descendants of the amazing Inka civilization. For three hours we walked around and explained more of our history, exploring The Temple of the Sun, the Quarry, the Intiwatana (Sun Dial). After the tour they had some time to explore on their own, take their own pictures (perhaps some selfies!) and they promised each other they would come back one day. Once we were back in Aguas Calientes, lunch was ready for them. Everyone did a little shopping and exploring in Aguas Calientes before their evening train back to Ollantaytambo and 5 hour drive back home. This story might seem repetitive of the previous trip to Machu Picchu last February when we took our porters and their families to Machu Picchu, but it is amazing (and a bit sad) how hard it is for our own people to visit this amazing Wonder of the World. We will never stop taking these trips. It is a shame how expensive it is for people to get to and get in Machu Picchu. We love sharing our ruins with our friends from other countries, but it is not right for these private companies who own services like the trains to charge so much to Peruvians which make it prohibitive for our people to visit. It is important for all Peruvians to be able to witness first hand our history. We hope to help make that happen. GREAT NEWS!! 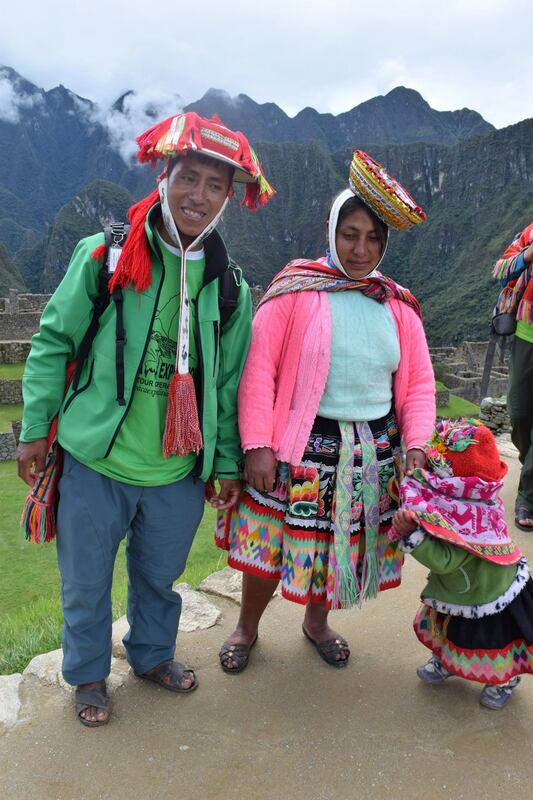 Alpaca Expeditions has had another opportunity to make a difference in the lives of the families of some of the porters (chaskis) that help us and our trekkers carry supplies on our Inca Trail treks. 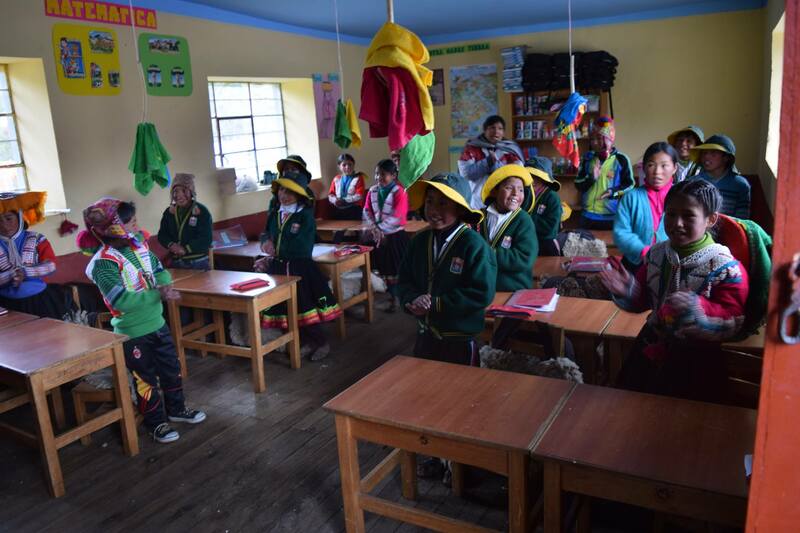 In the tiny town of Wakatinu is a school which serves the families who live in the agricultural communities in the area of Ocongate, at the base of one of Peru’s highest perpetually snow-capped mountains, Ausangate. 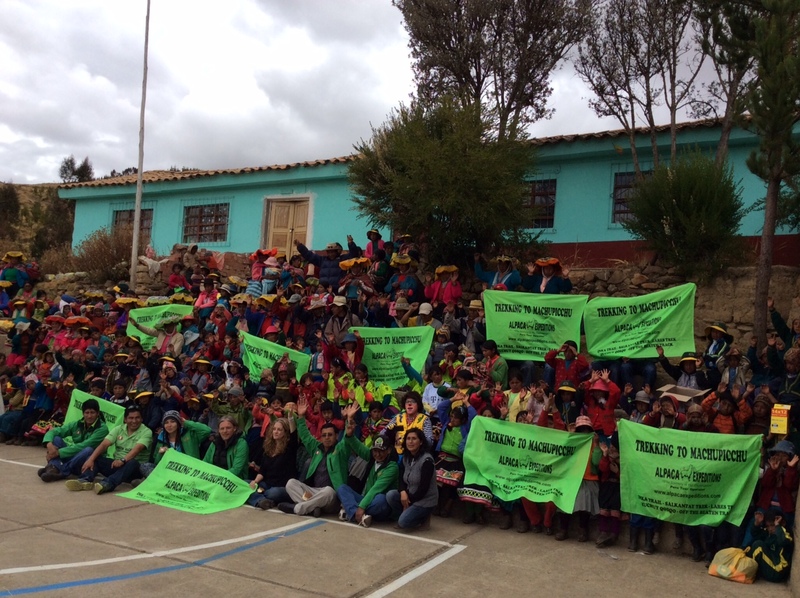 In the past year Alpaca has taken some of the needs of this town on as a social project and has been supporting them with school supplies, hygiene products and a native tree planting project. Because a number of students attending this school are growing up and moving into the high school classes, there is a demand for another teacher. Unfortunately, the budget for education with the Peruvian government has gone down, leaving the classes overcrowded – and more than they can handle and still receive a proper education. Attracting teachers to this fairly isolated location has proven to be a challenge. Most people that would consider this type of work do not want to be so far from their own families and the comforts and conveniences of the larger towns and cities. The parents of the children who live in this area are subsistence farmers and the standard of living is about as basic and rustic and one can imagine. There are basically no amenities or entertainment of any kind outside of their small homes. So the residents of Wakatinku together with the Director of the School, Señor Martin CCoscco Huarancca and the head of the Parent-Teachers Association approached Alpaca Expeditions and asked us if we could help them with this dilemma. We agreed, and they now have a teacher! Señora Humpire Colquehuanca, a native Quechua-speaker from the Puno area in the south of Peru is now teaching the 12 to 17 year olds Mathematics, Art and some English. We want to take this opportunity to thank YOU, our trekkers for helping us support this project. Just the fact that you have booked a tour through Alpaca Expeditions means you are making a difference in the lives and futures of these children who have been born into unfortunate poverty. With the supplies and teachers that we are able to help provide these children, they are receiving a much better opportunity to improve their future lives through their better education. THANK YOU!!! On Thursday, May 7, 2015 Alpaca Expeditions partnered up with Organization HERO (Humanitarians for Education and Recreation Outreach) to bring 4 computers to the children at the school at Wakatinku, the village which is home to many of our Inka Trail porters. This was our 4th visit to this village, at the base of Ausangate, the 2nd tallest mountain in Peru (21,000 feet elevation). 204 children from around this agricultural region walk as much as 2 hours each way to get to the school. We left early on Thursday morning along with Brian Hindman, the Founding Director of HERO, and 9 of his associates. We made the 3.5 hour drive from Cusco to Wakatunku, then set up the computers for the school. Unfortunately, due to amount of rain we have received during this “dry” season, the internet in the village is completely down. They are working on getting this back up for the kids to take full advantage of these computers. But for now, they are all set up and ready to be used and the kids have already started using them for homework. We also brought along additional school supplies, similar to our previous trip to Wakatinku in August 2014. Each child received notebooks, pencils, erasers, and other assorted hygiene items to encourage them to study and practice good hygiene. And of course everyone needs to have some fun, so we also brought a bunch of sports equipment for them to play with. Alpaca Expeditions is so proud to be able to support these families in their humble villages, and to offer them the tools to help improve their lives. HERO (Humanitarians for Education and Recreation Outreach) was started as a way to give back to local communities and especially children around the world. Each year they select organizations in need and donate school supplies and sports equipment , when possible, purchasing from local vendors in an effort to support the local economies of the recipient organizations. For more information on HERO, go to http://www.heroworldsupport.org. In February the Inka Trail is closed due to heavy rains, government maintenance and the cleaning of the Trail. 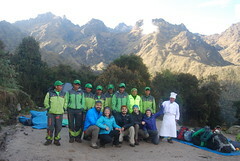 Alpaca Expeditions took the opportunity during this off month to create lots of activities such as, cleaning the trail for the Lares trek, the Huchuy Qosqo Trail, Inka Trail, and the training for our chefs and guides. 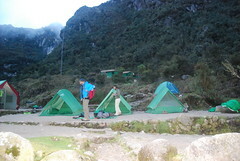 We decided to reward our best Inka Trail group of porters and their families with a journey to Machu Picchu. 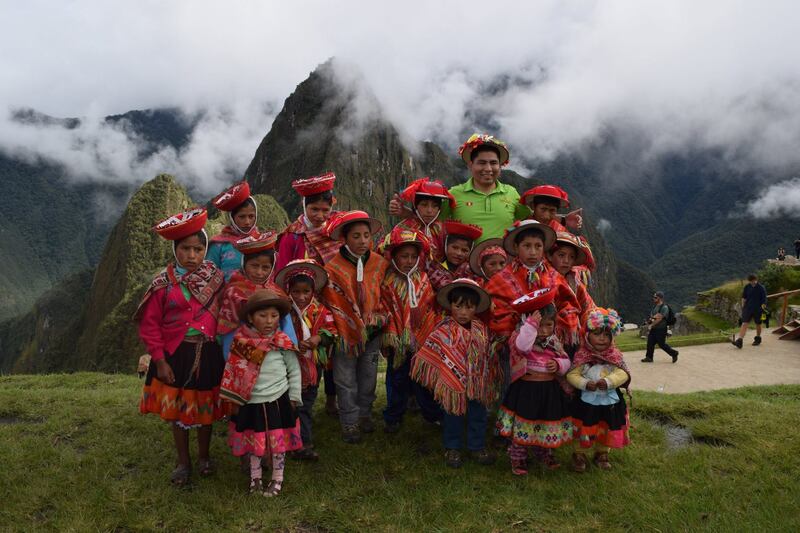 They are from the community of Wakawasi located in the Lares Valley – all of them native Quechua-language-speakers who had never been to Machu Picchu even though they had trekked the Inka Trail hundreds of times. Wakawasi porters were the most organized and responsible porters in 2014. In total there were 65 people who went to Machu Picchu – 35 adult porters and their wives and the rest were children around the age of 8. This journey started on Saturday, February 28th, 2015. Wakawasi is at 3800 meters above sea level. We collected them from their village in two buses to transfer them to Ollantaytambo (a very colorful Inka town) to catch the 7:00PM train to Aguas Calientes. It was so nice to see how excited they were (especially the children!) considering that this was happening for the first time in their lives! After the two hour train journey we arrived in Aguas Calientes. We took them to the restaurant El Tupana Wasi to enjoy dinner as one big family and to enjoy our vacation together. After dinner we headed to our hotels, all provided by Alpaca Expeditions. We decided to meet the next morning at 5:00AM to be first in line to catch the first buses up to see the ancient ruins at Machu Picchu. On Day 2 we met at the hotel lobby for an early breakfast and then walked to the bus station. All the tourists and other Machu Picchu visitors were so captivated to see such a big group -all wearing their traditional clothing! We were on one of the first buses to leave and everyone was so happy to have such a nice morning. We arrived at Machu Picchu and the most exciting part for them was when we got to the Watchtower House of the Inkas. Our porters, their wives and children were overjoyed that they were at the New Seventh Wonder of the World, a dream-come-true for these farming families who frequently never leave their villages. And here they were in the magnificent ruins that were built by their ancestors, the Inka! After checking identification at the Entry Checkpoint, we all headed to the popular lookout point for Machu Picchu where they all got their family pictures. We then began with their tour of Machu Picchu (in Quechua!! )- thanks to our marvelous guides, Amoroso, Elio, Yoel, and Sabino. We explored all of Machu Picchu and took loads of pictures of them which we are going to make into a DVD/ video for them. Finally we returned by bus from Machu Picchu to Aguas Calientes for lunch, then took the afternoon train at 2:55PM to Ollantaytambo where Alpaca’s buses waited for then and drove to their village arriving, around 8:00PM. Who are the Wakawasi People? Wakawasi village is located at 3800 meters above sea level; they are part of the Lares Valley and located in Urubamba province. Their main economic activity is agriculture and they farm potatoes mostly, though of course, they do have llamas and alpacas as well. Our company employs most of the people of this village as porters and horsemen. We want to make this a tradition. Machu Picchu, as a New Seventh Wonder of the World should not only be visited by tourists. It should also be known and visited by the local people, to put them in touch with their history and heritage. Unfortunately, even the cost of travel makes the likelihood of this happening prohibitive for them. 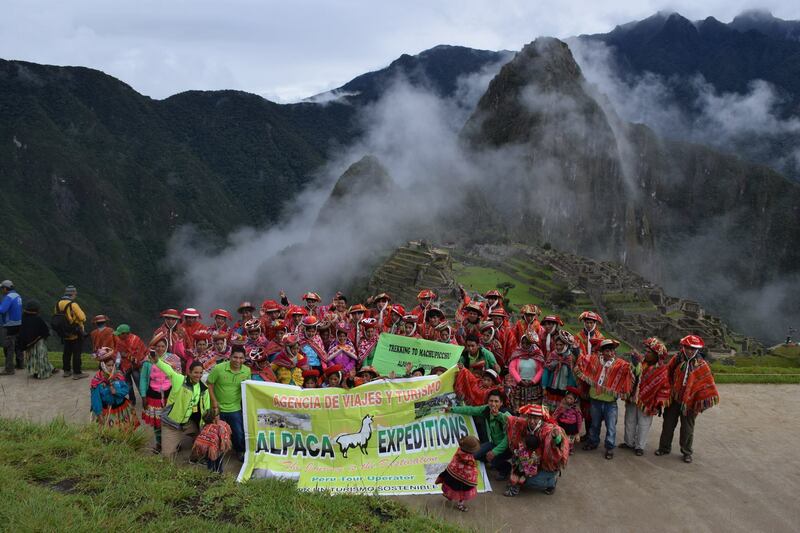 Alpaca Expeditions has now begun this tradition and we hope in the future, to be able to share Machu Picchu with all our porters and their families, especially their children. Not just for them, but also for other villagers who have never been to this magical Inka citadel. Our next group will be in August, which is during winter vacation for the schools in Peru (Southern Hemisphere). We decided that we will be taking the residents of two small villages from the area of Ocongate. Ocongate is located at 4100 meters above sea level and belongs to the Ocongate district and Qusipicanchis region. The villages are called Wakatinku and Ullucha and we are expecting at least 100 people including our porters, wives and their children. 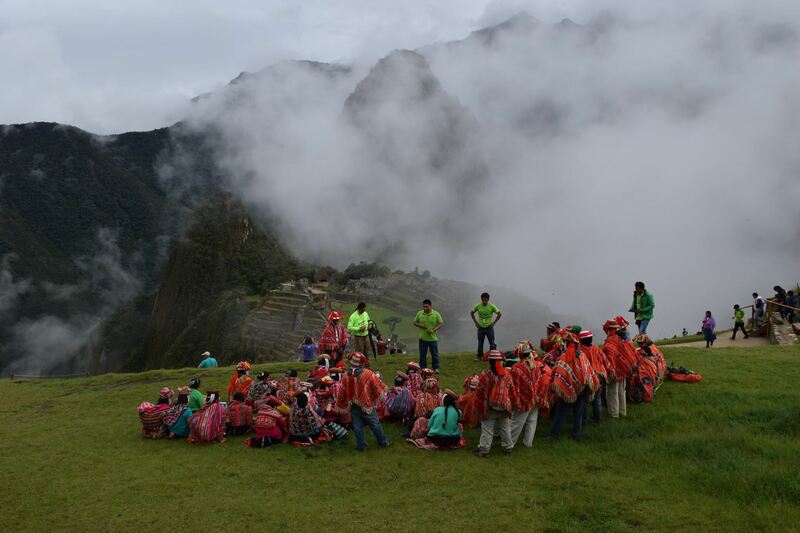 Then next year in February, during our summer break we will be inviting other villages such as Choquekancha –Lares and Pisaq Communities. 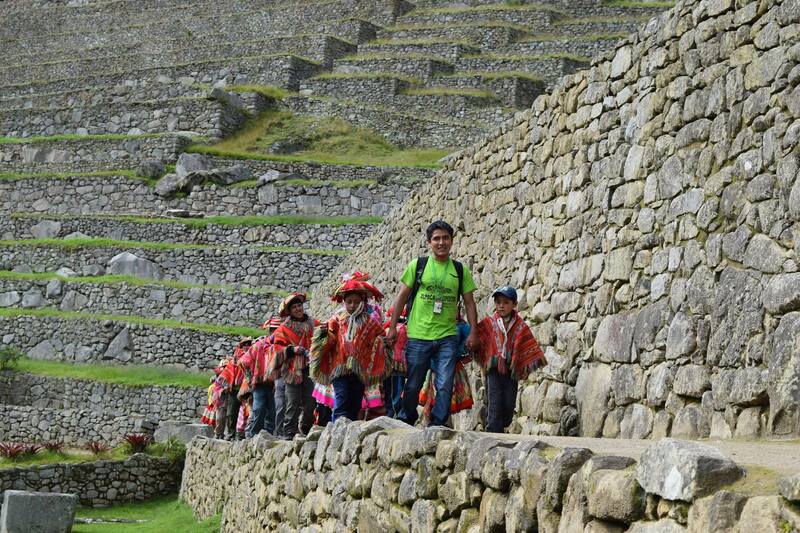 You may be wondering why it is that our porters have hiked the Inca Trail so many times, yet never seen the ruins. The Peruvian government rules do not allow our porters to enter Machu Picchu from our last campsite, so their only options are to go on their own, or not go at all. In their lives in their villages, our porters are subsistence farmers, living very close to the land. Many of them use the barter system to get the things they need, trading potatoes and other things they farm for what they cannot grow. Money is very hard to come by; therefore many of the things that cost money remain out of reach for them. Going to Machu Picchu costs money. First they have to get from their remote villages to Cusco. They need transportation, hotels, meals, and bus tickets to and from the ruins. Plus they usually have several children in tow to take into account. How can you help to be part of this project? 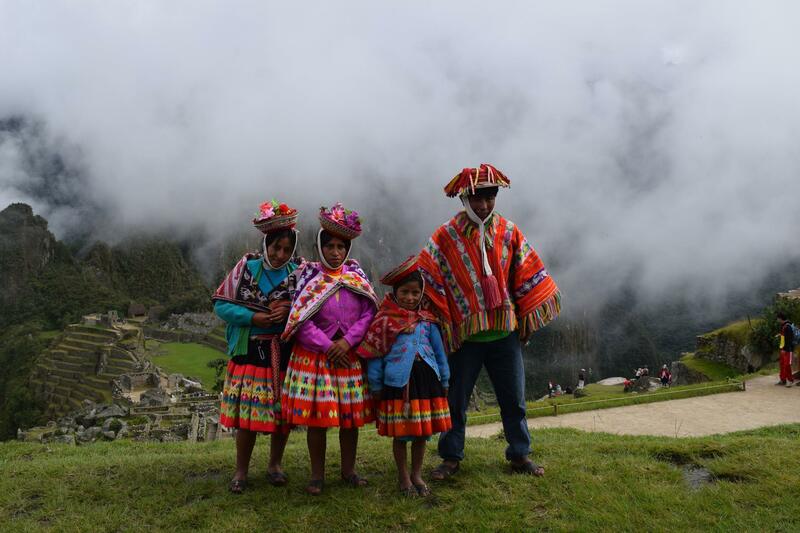 Just by choosing us as your trekking company you are already helping these families make it a reality to have the opportunity to visit Machu Picchu. 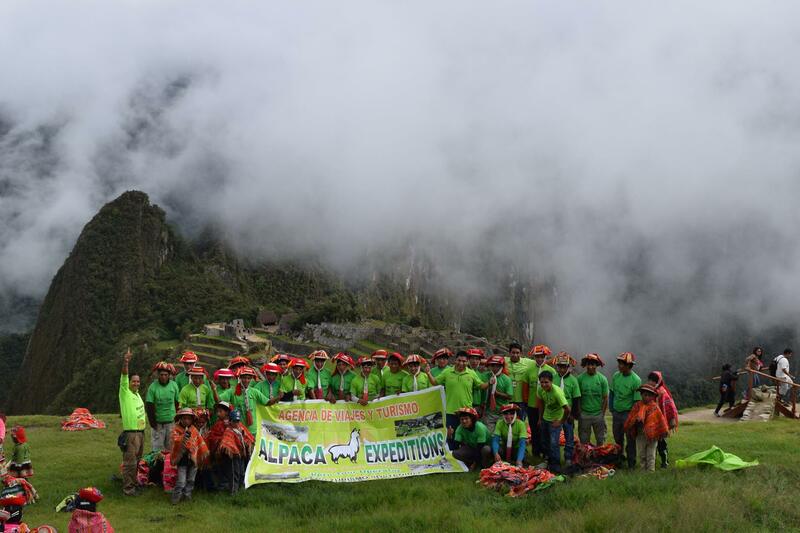 Alpaca Expeditions is working to make the lives of our porters and their families better, from the viewpoint of learning about our culture and environment. 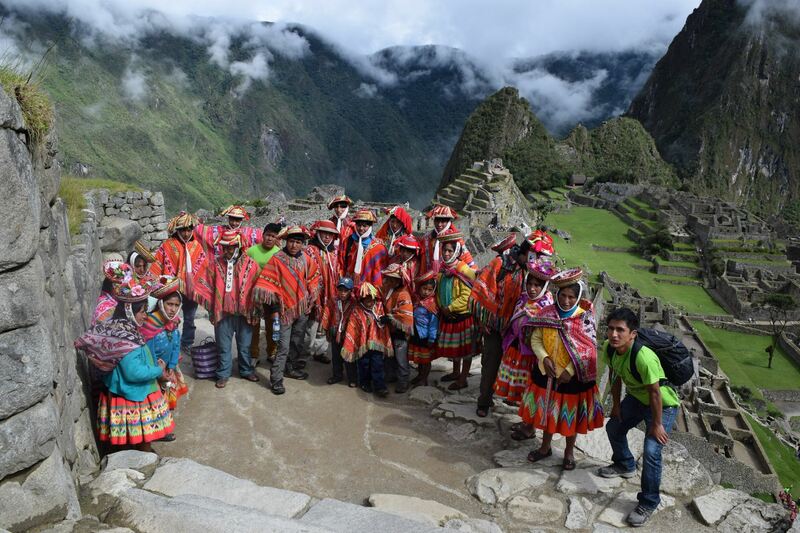 You can help us to create trips to Machu Picchu for more people who have never been and help them have the opportunity to see what their ancestors created. You can help with making contributions toward purchasing train tickets, hotels or simply economically supporting this project. We can purchase any tickets on your behalf for them – just contact Alpaca Expeditions. Just as many of us (and as many of you) love to travel and explore the various attractions all over the world, our local people would also love to travel. Unfortunately, due to their economic situation they are not able to make it happen. But we at Alpaca Expeditions consider that is very important for them to know their heritage, especially living so close to one of the Seven Wonders such as Machu Picchu. We decided that by helping them to make this happen it would help them to better appreciate their magnificent culture in Peru. Believe it or not, there are even some children that have never even been to the city of Cusco. We would love to help them have the opportunity to get to know some of our other heritage and history besides Machu Picchu. Alpaca Expeditions was created with a focus on our community. There are lots of companies that trek the Andes, but unfortunately many of the companies do not seem to remember their roots and what makes our culture so special. And too many people have forgotten about those in need. We have always done things differently. We provide all our team with proper equipment for free, health insurance and good wages. We are fully aware that we would not have a company without the hard work of our “Green Machine” and we are focused on helping to make sure they are well taken care of. Last weekend we began our social work project of visiting a local community to make sure they have the resources they need for the people, and specifically the kids, to prosper. We will focus on a different village every year and have begun with the Wakatinku village. This is an amazing village that a lot of our team calls home. We plan to visit once a month with different initiatives. We began with supplies for the kids for school and provided a little break from their regular routine and introduced them to a clown, something most kids had admitted to never seeing before. You can read all about our visit…Alpaca’s Social Project. But this is just the beginning. Next month we plan on working with them to plant trees. And we have begun collecting books to fill their library shelves with books for the kids to read and enjoy. So many of you have asked how you can help. Any type of donation is needed – from hats to books so if you have some in your house and there is extra room in your luggage pack some and we will make sure they get in the appropriate hands. And for those of you with more time, come with us and help us plant trees or give out treats. Not only is it a wonderful experience, but these communities are beautiful and the local people would love to show you their home. We know we can still do more and would love to hear from you on some suggestions on how you think we can help.